Introducing children to art is a really fun thing to do. It doesn't have to be all serious. I don't feel the need to overload small kids with names, dates, deep philosophical meaning. But what I can do is go along to art exhibitions and say, 'I like that picture over there by an artist called Lowri. He's painted the seaside and I like the colours'. 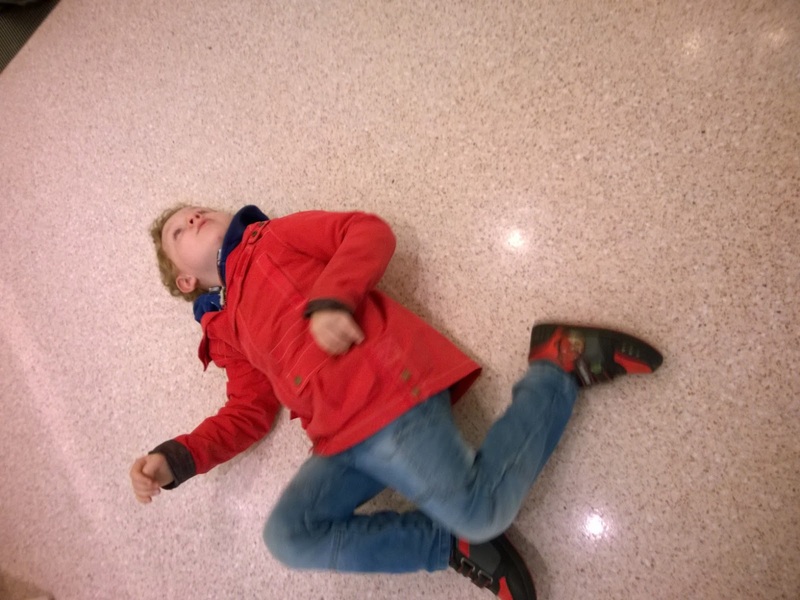 I can ask my little art critic to pick something they like and tell me about it. How do the colours make them feel? What time of year is it? 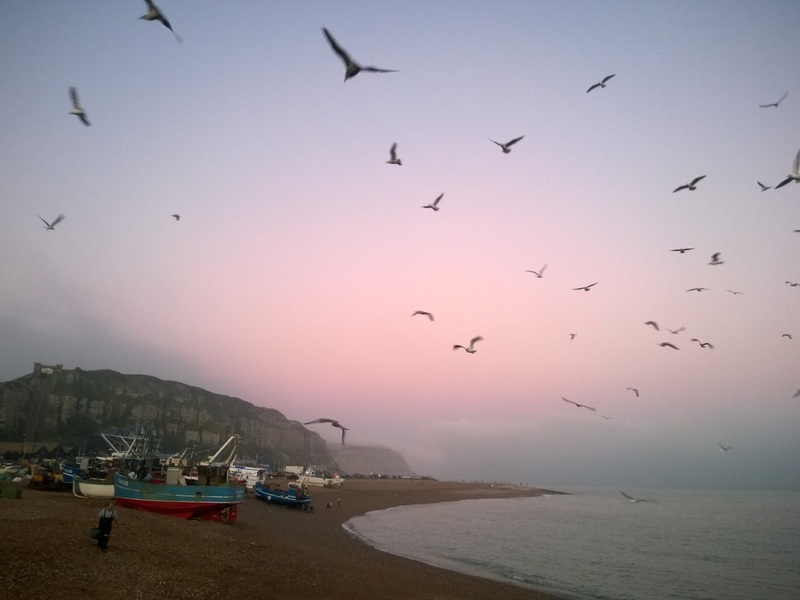 One of our local galleries is the Jerwood in Hastings. As locals we get reduced rate entry, so for all four of us that's £6 currently. This makes it reasonable to go to a few times a year, and worth repeat visits as they change exhibitions and have new displays. 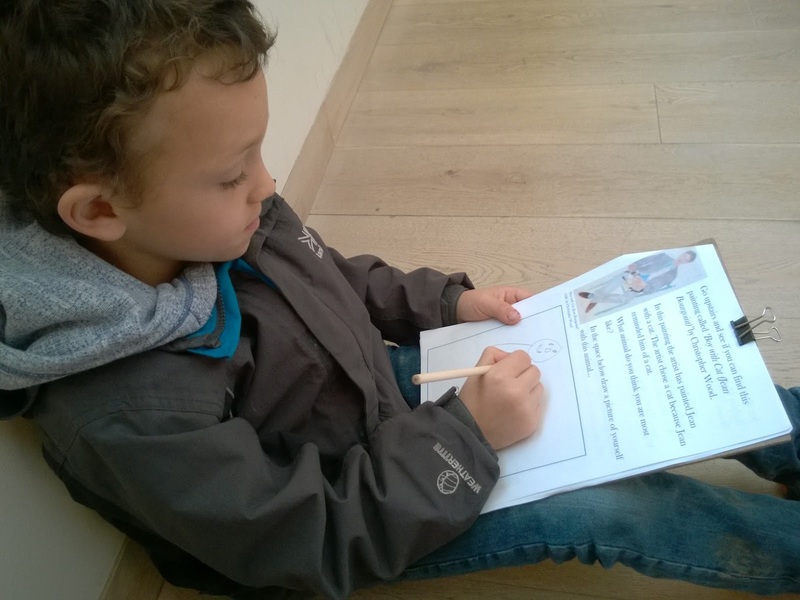 The children's activity sheets available for free enable us to play treasure hunt with selected pictures, and guides us through questions and activities to get us thinking about the pieces, such as making a self portrait. The gallery also runs kids activity days, which we've enjoyed in the past but which can be really busy, so it's nice to go at quieter times too. Sometimes it's good to get a different perspective on a picture, as Toby demonstrated by spinning on the floor as he described the contents of one lino cut still life. Other times it's good to put yourself in the perspective of the artist. 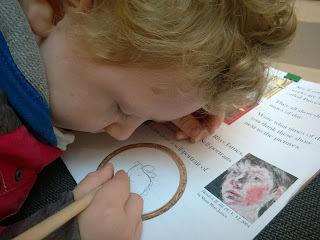 Ollie here is examining a picture of a boy with a cat, and drawing a portrait of himself with his hamster. It was the last day of an exhibition 'Lowry by the sea', which was really good to broaden my own horizons as I have only ever seen his pictures in books and they were all of people in cities. To see seaside images, and trials with water colour and felt tip pens was really interesting. Ollie enjoyed the activity that called for him to add boats to a Lowry picture of the sea. He took an interest this time in the medium that the pictures were made from, with the wide pallet knife marks in an oil painting capturing his attention. He said it looked like a puzzle. When I explained how it was made he requested some oil paints to try. I've never used them myself, I think a trip to the discount bookshop that sells art supplies is needed so we can try it out. The boys especially like the abstract and naïve art styles. I think seeing pictures like the ones they produce at home up on the walls of a real gallery inspires them and gives them confidence. 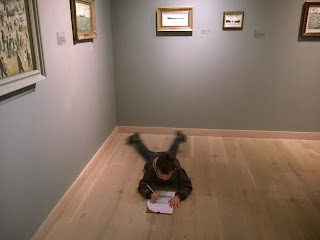 Finding styles that kids can relate to is the trick to opening a lifelong enjoyment of art. Instead of looking at art as something grown ups do, that they could never achieve, they can see that they themselves are every bit as good as the pictures on the walls. 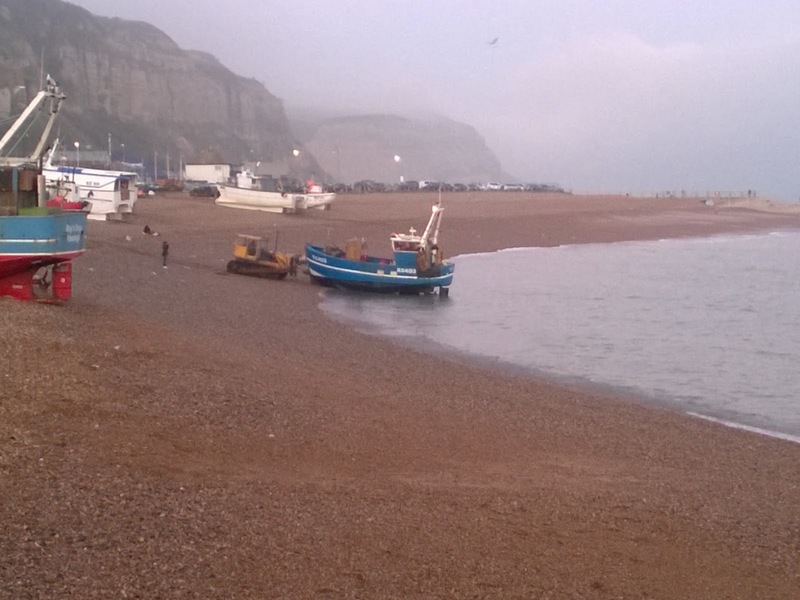 We spent the evening walking on the beach and watching with great excitement the slow drama unfolding of a fishing boat being pushed down to the sea ready for it's night's work. The boys clapped and cheered when it finally launched, and seeing how much they liked it I took a couple of photos so they could look at them again, perhaps use them to make their own pictures. Art is all around us, in the light shining through Autumn leaves thrown in the air, or the sculptures the kids make by balancing piles of pebbles. It isn't just in a gallery, but sometimes it's nice to go and see that type of art too.